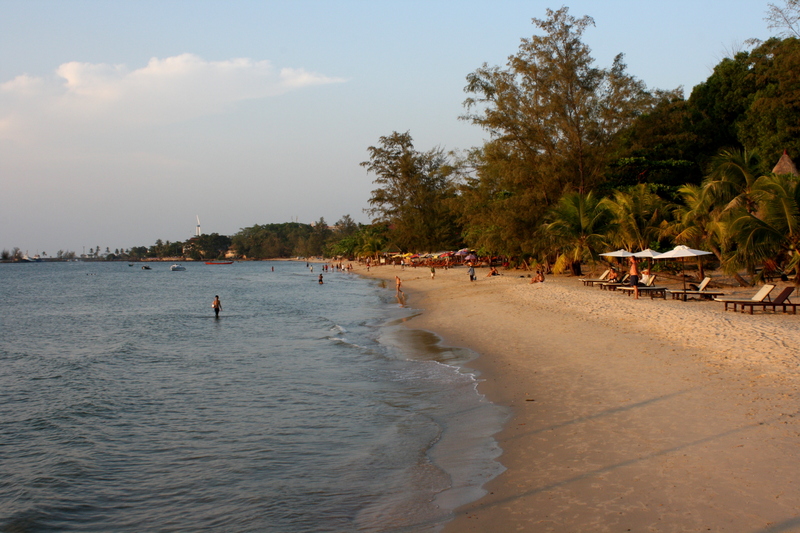 I hadn’t heard too much about Sihanoukville before I took the five hours bus ride from Koh Kong. The only facts I knew were from the Lonely Planet guide, which pointed me to Serendipity beach as the place to go. I had my heart set on a place called Monkey Republic, which was an “our pick” choice, but when I arrived at the bus station and weaved myself through the moto and tuk-tuk drivers, a tall, Italian man handed me a bright green flyer. Rooms for $2-12 and free wifi shouted out at me from the paper. He then told me that it was a quieter, not as popular beach, but had a “hip” nightlife. It took me less than 2 seconds to tell him I was sold. I piled all my luggage on yet another moto bike and was on my way to the beautiful beach at Victory Hill. The Green Mood was perfect. The room was large and only $4 (the $2 rooms were full), and although I wanted to race to my computer to update my blog and edit some pictures, I refrained and headed down to the beach. And what a beach it was. Quiet. Very few tourists sprawled out on lounge chairs. Cambodian children running around, laughing and splashing in the water. Peaceful. Soft waves lapping on the white sand. Fisherman relaxing on the pier with their poles dangling below them. Did I mention quiet? It was everything I wanted in a beach. I felt a little bit guilty being at a beach in Cambodia when there are so many other sights I could be seeing and I had already spent pretty much all my time in Thailand on the beaches, but I stifled that guilt quickly and soaked up the sun. I took a long walk down the beach and nestled into a spot on a rock and just stared out at the clear, blue water. I loved where I was. I loved that I saw smiling children everywhere. Children that seem to have no cares in the world. Children that know nothing better than selling fruit on the side of the road, but they’re happy. I found that the Cambodians on this beach were not like the ones on the other beaches (or so I’ve heard and read). They don’t try to swindle you. They don’t try to steal your things. They just love your company. On my second day in the town, I was floating around in the salty water, when one of the children came swimming over to me. Then another came. And another. And another, until there were about 8 of them splashing around me asking what my name was. They kept repeating my name over and over again with huge smiles on their faces. After about 30 minutes of feigned communication, and all of the foreigners staring at me from the faraway beach, they were summoned by an older authority and had to leave. Huge smiles and waves, they said goodbye and kept saying goodbye until they were out of sight. Definitely one of my best experiences with locals! 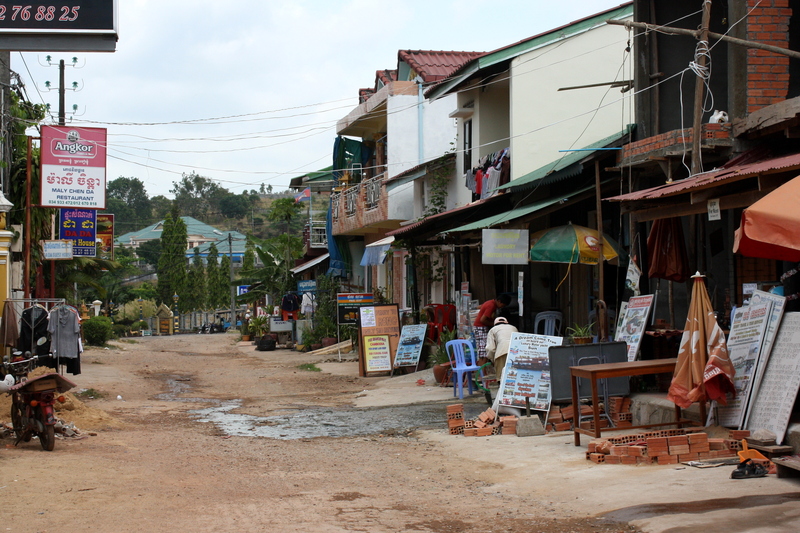 The Victory Hill town was a couple of unpaved streets lined with mostly foreigner owned restaurants, bars and guesthouses. Music resonated from the streets starting around 6:30ish, it wasn’t too crowded, meaning the amount of drunk travelers and debauchery was at a minimum, and it had a pretty safe vibe. When I’m traveling, I try to avoid farang food and attempt to delve into the local cuisine, which was a little difficult in this area. I happened to find a BBQ place run by a Cambodian that seemed to be cooking a fresh seafood dinner made up of prawns, squid, and barracuda. Match that with 50 cent Angkor draft and I was sold. After I had finished, the owner came over, sat down next to me and we engaged in an interesting conversation for the next 30 minutes or so. I loved hearing a local’s perspective of life in Cambodia. He talked about the war, owning a guesthouse/restaurant/bar in a “traveler hotspot” (he included a story about one of his guests who almost died the night before from a drug overdose, which has thus made up his mind to get rid of this part of the business), and where he comes from, where he’s been and where he’s going. He spoke amazing English and used words like “demonstration” and “contentious.” I just kept getting lucky running into great locals! I had an amazing time in Victory Hill and although I did not explore the other beaches, I’m extremely happy that that is where I ended up. Completely my style and the perfect way to kick off my Cambodian adventure! Victory Beach just made it onto my to-see list. I’m planning on being in the Sihanoukville area for a few days. Like yourself, I only really knew about Serendipity Beach from the Lonely Planet. Sounds like you found something better. This sounds like my kind of place. What was the name of the guesthouse you stayed at?